Have no place to put your other device when you have a TV mounted to the wall? A wall shelf will be a solution. Neatly organizes your TV accessories, wall shelves gain back valuable floor space, eliminate wires and cable and make your entertainment center into a work of art rather than an eye-sore. Need a place to securely hold a cable box, DVD player, or virtually any other component? 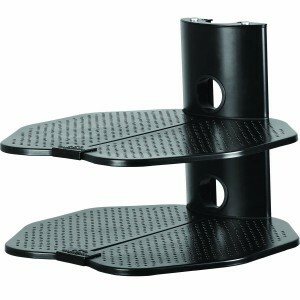 The OmniMount ECSB Component Shelf Wall Shelf will be an answer. Made of 8mm tempered glass, this shelf is sturdy enough to support for up to 30 lbs. The wall plate hides bolts, for a clean, modern look. It also features a pivoting arm for side-to-side movement and a black nylon stabilizing strap to keep your components in place. When you have a TV mounted to the wall you will often find that you have no place to put your other devices. This Floating Glass TV Accessory Shelves will be a solution. 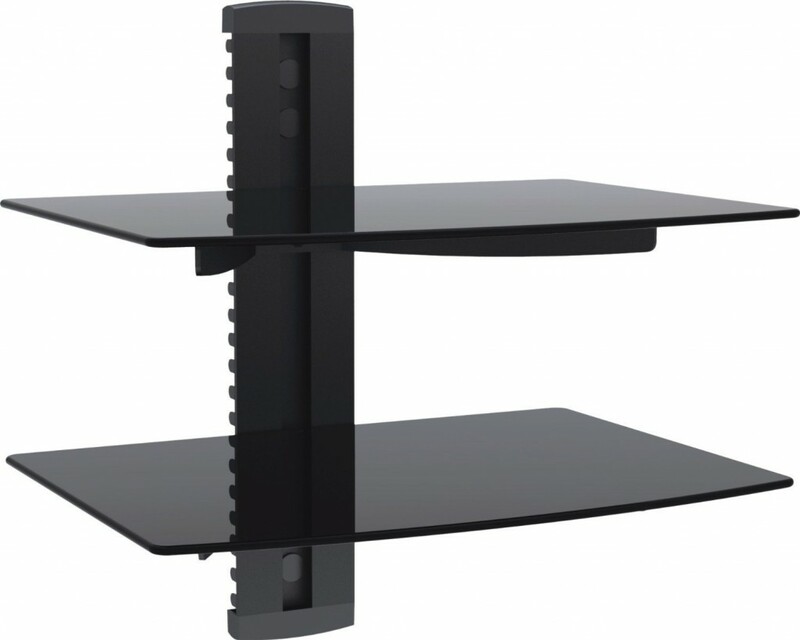 There are two large strengthened tempered glass shelves that supports a maximum of 8KG on each shelf for your VD/Blu-Ray Players, Satellite/Cable Boxes, Games Consoles and more. Also, the Cable Management System will hide all your messy cables. Neatly organize your DVD players, HD recorders, cable boxes and other AV equipment with this Mount-It! Wall Mounted AV Component Shelving System. 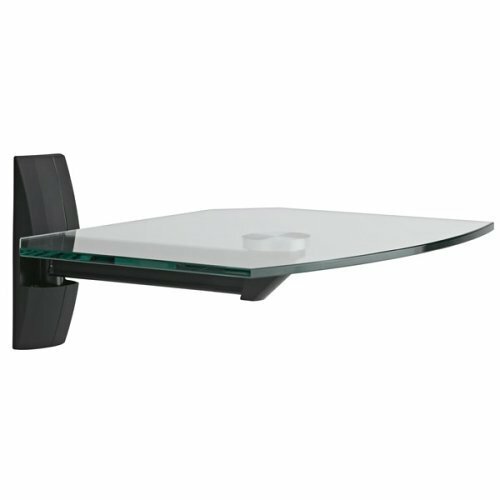 It has 2 shelves that are constructed out of tempered glass and are height adjustable for convenience. This sturdy shelving system delivers a weight capacity of17 lbs per shelf. Easy and secure installation. For something sturdy to keep your center-channel speaker, DVD or Blu-ray player, or receiver, you don’t need to look further. This wall-shelf system features sturdy construction and offers maximum shelf capacity up to 60lbs. 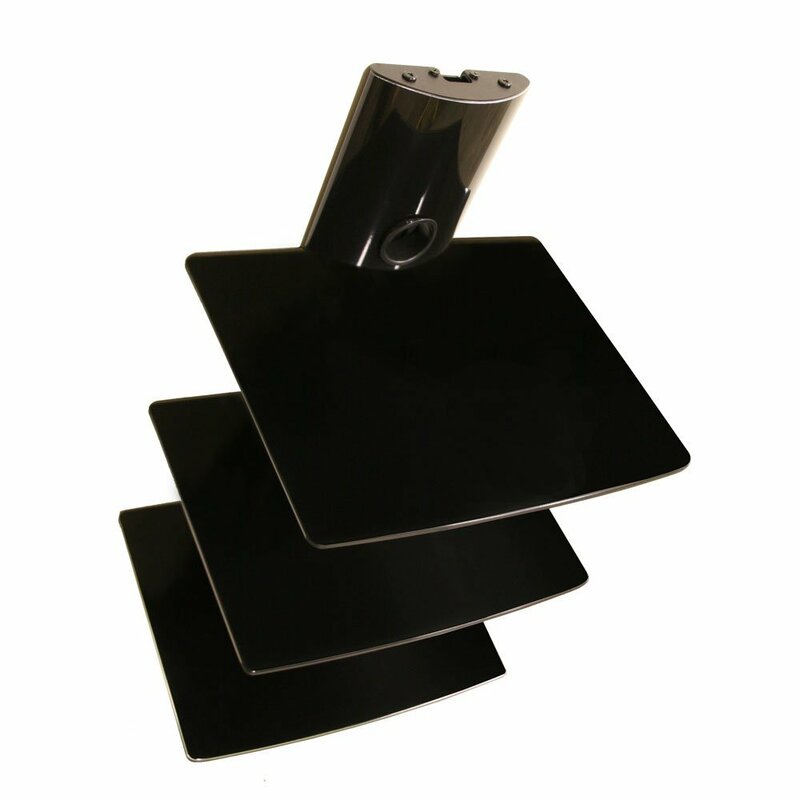 The two shelves are made of strong and safe tempered glass and are adjustable. Designed to fit under your television or to the side of your entertainment center. 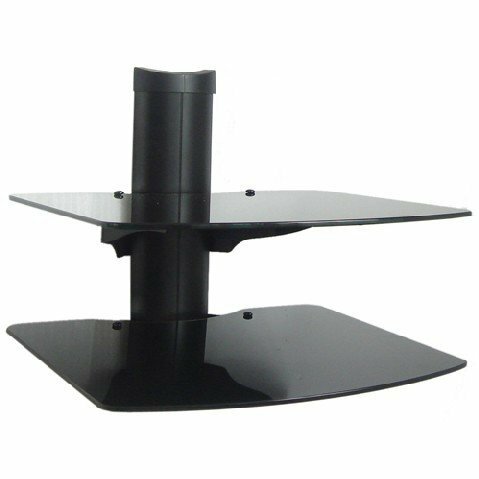 Hold your entertainment audio / video component to the wall with style using this black three shelf DVD wall mount shelf and bracket. Sleek and sturdy, this shelving system is great for DVD player, Bluray player, Cable Box, and Game System. There are three glass shelves for multiple components. Designed to fit under your television or to the side of your entertainment center, the unit can hold up to 50 lbs total.